The current literature sources on the electrochemical capacitors, which are divided into the film (dielectric), electrolytic, and supercapacitors, are reviewed. The supercapacitors are in turn subdivided into the double-layer capacitors, which use the EDL recharge on a highly-developed interfacial surface of electrodes; pseudocapacitors, where the charge is stored in a faradaic pseudocapacitance of sufficiently reversible redox reactions and the EDL capacitance; and hybrid capacitors, which employ a variety of electrodes. A macrokinetic theory of operation of double-layer capacitors is considered. Effect of various factors on the properties of electrodes utilized in supercapacitors is analyzed. A novel type of hybrid capacitor, which has a negative electrode of activated carbon cloth and a PbSO4/PbO2 positive electrode, is proposed. A theory of capillary equilibrium in hermetically sealed electrochemical capacitors is considered. 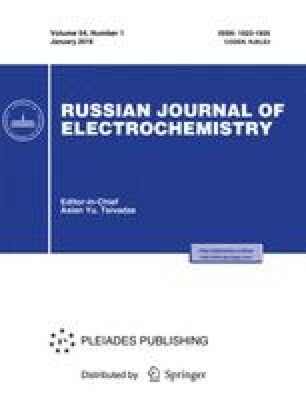 Specific features of the application of voltammetric and impedance methods to studying electrochemical processes in supercapacitors are revealed. Characteristics of electrochemical capacitors and batteries are compared.